Comments and questions via Datacorner Rants. Demo plots odd harmonics to create a square wave. 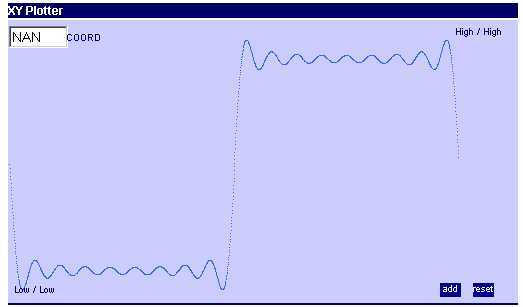 ADD to increase the number of harmonics, RESET to start with a sinusoid. Source Code the jsp source. You will need a server running a jsp container (tested with Tomcat 4.13) to execute this code. Post any questions, comments via Datacorner Rants. Click the helpRant button. Demo Create sliders using the Zapatec widgets programmatically. User can add sliders for conditions live while using the web page. rantsJSNall.txt is the source for the login screen. saveEd.txt is the source for the tinyMCE container. You will need a server running a jsp container (tested with Tomcat 4.13) to execute the functionality. A minimal amount of tailoring is required to set up the file storage area on your server. comments via Datacorner Rants. Click the helpRant button. Would appreciate any enhancements you may make along the way. Demo webmark benchmarking tool lets you answer the burning question, "should I entrust operation of my mission critical functions to a remote service?". Provides a stripchart display of ongoing latencies incurred by the service call. Next step, histogram the latencies. And after that, support true web services by uploading a message body as well as the call. And of course, cookie support. Have fun. View the source code. Makes use of 2 jsp's: doCallTime.jsp sets up the display and provides the controls. doCallTime calls doGetTime.jsp which actually makes the call to the remote service and measures the latency. doCallTime.txt is the source for the controller. You will need a server running a jsp container (tested with Tomcat 4.13) to execute the functionality. comments via Datacorner Rants. Click the helpRant button. Would appreciate any enhancements you may make along the way.